19:18 GMT - This evening's Los Angeles premiere of "The Hunger Games: Mockingjay - Part 2" has been toned down in light of the Paris attacks. Lionsgate studio says there will be no interviews with the cast after the premiere, out of respect for the victims. 19:36 GMT - CBS announces that it has pulled episodes of "Supergirl" and "NCIS: LA" that were to air today because the plots for both shows bear too much resemblance to the attacks. The episode of "Supergirl", about a female superhero, dealt with bombings on a fictitious city and the episode of "NCIS", a crime drama, focused on a teenager recruited by a terrorist organization. 19:40 GMT - US Secretary of State John Kerry has arrived in Paris to underscore Washington's "strong relationship" with France in the wake of the attacks, a State Department spokesman says. "He will reiterate America's commitment to our strong relationship with France and express our condolences as well as our shared resolve to continue countering violent extremism here and around the world," State Department spokesman John Kirby says. 19:56 GMT - A leading Belgian jihadist in Syria who has boasted in videos about planning attacks in Europe and evaded police in his home country is being investigated as a possible mastermind of the Paris attacks, a French source says. Abdelhamid Abaaoud, a 28-year-old Belgian of Moroccan descent, has fought along the Islamic State group in Syria and has been on the run since police stormed a jihadist cell in eastern Belgium's Verviers in January. 20:02 GMT - One of the Paris attackers reportedly ran a bar in Brussels that was shut down because police said customers smoked marijuana there, according to a document obtained by AFP. Brahim Abdeslam, who blew himself up outside a bar in Paris on Friday, ran his own bar in the Belgian capital called the Cafe des Beguines, local media say. A municipal closure order posted on the front door says Belgian police believed the bar in the impoverished Molenbeek area was being used by clients for taking "hallucinogenic substances". 20:03 GMT - The Molenbeek area in Brussels, long infamous in Belgium's capital city for its crime and unemployment, has emerged once again as a European hotbed of Islamist extremism where residents say they live in fear. 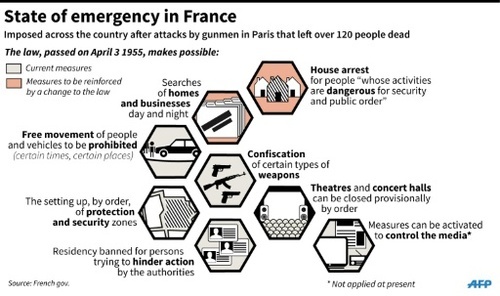 Residents of the largely Muslim area say they were caught in the middle of a war as police blocked off a main street today in the latest of many raids since it emerged that at least one of the Paris attackers had lived there. 20:17 GMT - Belgian Foreign Minister Didier Reynders calls in an interview with AFP for intelligence sharing in Europe to be strengthened in the wake of the Paris attacks. Belgian intelligence services have come under growing scrutiny following revelations that several of the attackers lived in Belgium. "We have to be able to trace these links wherever they are, whether it's in France or Belgium or elsewhere in Europe," Reynders says. 20:20 GMT - France has listed more than 10,000 people suspected of being radicalised or potential security threats, including homegrown assailant Omar Ismail Mostefai who killed scores of people at Paris's Bataclan music venue on Friday. According to police sources, the so-called "fiche S" ("S file") is updated daily to include individuals suspected of links to a terrorist movement or group. The "S" stands for the suspects' potential to endanger the "security of the state". 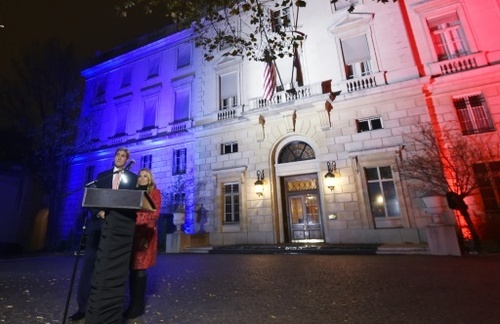 20:23 GMT - US Secretary of State John Kerry makes remarks outside the US embassy in Paris, speaking in both French and English. He also shares his thoughts in both languages on Twitter. 20:34 GMT - Germany's head coach Joachim Loew says the national football team's friendly against the Netherlands on Tuesday will be "a symbol of freedom" in the wake of the Paris terror attacks. "It's a clear message and symbol of freedom and a demonstration of compassion, as well as sorrow, for our French friends -- not only in France, but throughout the world," says Loew. The shaken German team spent Friday night in the Stade de France stadium after playing a friendly against the French as the series of violent attacks unfolded across Paris. 20:36 GMT - Netherlands coach Danny Blind echoes Loew's sentiments that the Hanover match should send out a message of solidarity. "I'm not the first one to say this, but I think that we should make a gesture," says Blind. 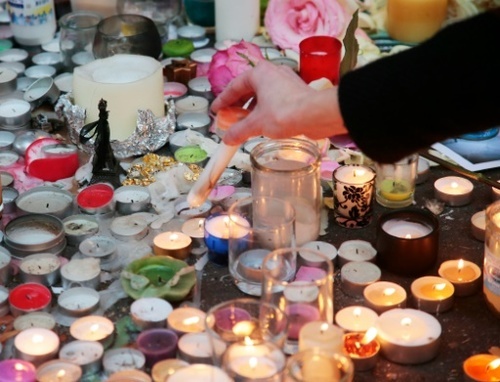 "For the victims, the survivors and the French people, but also for freedom, democracy and solidarity. 20:40 GMT - Armed police are present inside London's Wembley Stadium while France conducts a training session ahead of Tuesday's friendly against England, part of increased security measures following the Paris attacks. 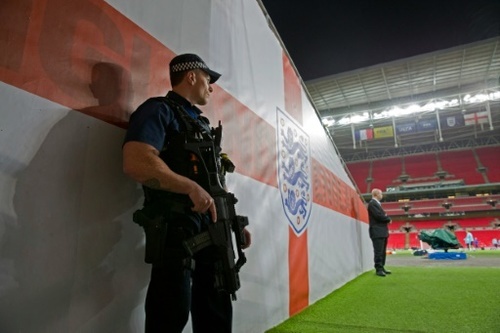 The bulk of British police officers do not carry guns as part of their day-to-day equipment and it is rare to see armed police at a sporting fixture in the UK, let alone a training session. 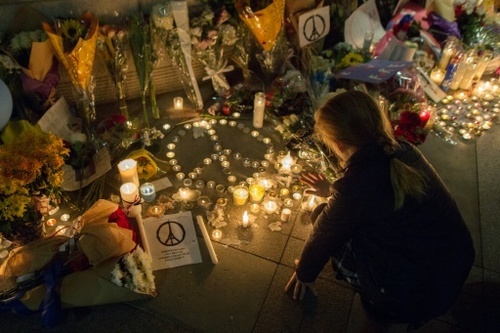 20:54 GMT - The UN Security Council observes a minute of silence in memory of the victims of the Paris attacks. All 15 envoys rise to their feet as the council chamber falls silent. The council expresses its "profound sadness and deep outrage at the horrendous terrorist attacks that took place in Paris," says Justine Greening, the British secretary of state for international development who chaired the meeting. Greening also offers condolences to the families of the victims of the Beirut bombings last week that left 44 dead. Both attacks were claimed by the Islamic State group. 21:40 GMT - French nationals returning from Syria could be "put under house arrest" and subject to tough surveillance, a government source tells AFP. The source says the presidency is considering "imposing draconian surveillance conditions" on any citizens returning from Syria. 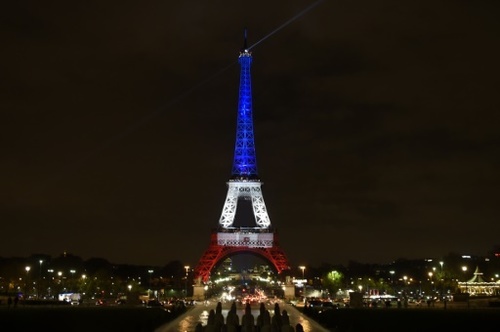 21:46 GMT - French hotels report a slump in bookings and a spate of cancellations since the attacks on Friday. "The months ahead are going to be difficult", says Didier Le Calvez, president of the luxury arm of the hotel union Umih Prestige. "We've just registered a 50 percent sales drop for November." He says that since Saturday, there has been a wave of hotel cancellations for the coming months, adding that the sector had "just been recovering" in the wake of the Charlie Hebdo attacks. 21:52 GMT - At La Belle Equipe cafe, candles flicker day and night among flowers, a memorial to the people gunned down at the site during the attacks across Paris. For Hamideche Dorea and so many others, the sight of her neighbourhood cafe turned into a shrine is surreal. "I have this fear now, I am scared to leave the house," she tells AFP. Dorea didn't go to work today, "but tomorrow we will confront life," she says. 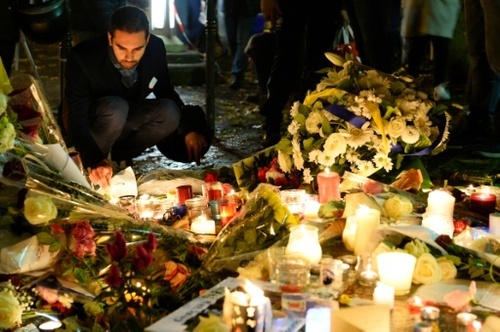 21:57 GMT - The area around the Bataclan was reopened this afternoon for the first time since the attacks in Paris. Hundreds of people gathered near the concert hall, including the father of a victim. 22:05 GMT - European countries, Canada and the United States are facing calls to deny entry to refugees after French investigators said one of the Paris attackers was a Syrian national who may have slipped into Europe as part of a wave of migrants. "It is understandable that countries need to take whatever measures they need to take to protect their own citizens against any forms of terrorism." "But focusing that on refugees, vulnerable people who are themselves fleeing violence, would not be the right way to go." 22:11 GMT - Hundreds gather at the 9/11 Memorial in New York to observe a minute's silence for the victims of the Paris attacks. French expatriates, tourists and Americans placed tricolour flags and roses on the monument, and sang the French national anthem. 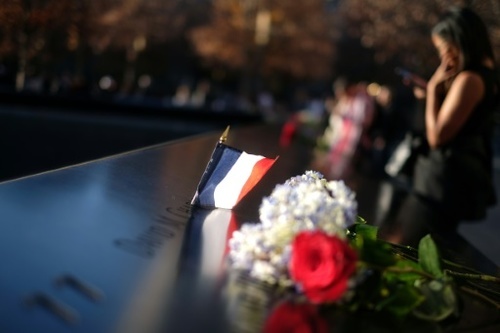 "The 9/11 national memorial and museum stands in absolute solidarity with France, just as the French people stood united and supported our city and our country when we needed it most," says Joe Daniels, president of the memorial. 22:36 GMT - AFP IS NOW CLOSING THIS LIVE REPORT after a day that saw French President Francois Hollande vow to destroy the Islamic State group after its atrocities in Paris, promising tough new anti-terror measures at home and intensified bombing of Syria. Hollande called for an extension of the state of emergency by three months and announced 8,500 new police and judicial jobs to help counter terrorism. 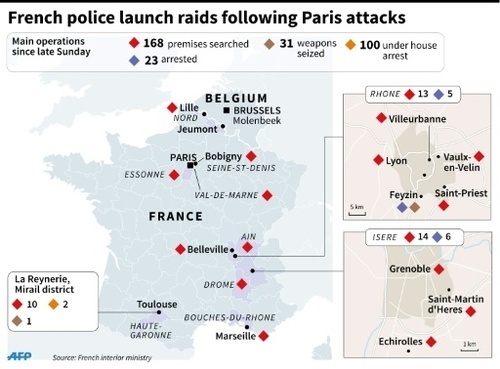 France and Belgium earlier staged dozens of raids on suspected extremists as the manhunt continues for an eighth jihadist, Salah Abdeslam, one of three brothers linked to the attacks. The brothers lived in the rundown Brussels neighbourhood of Molenbeek, where police have made several arrests. 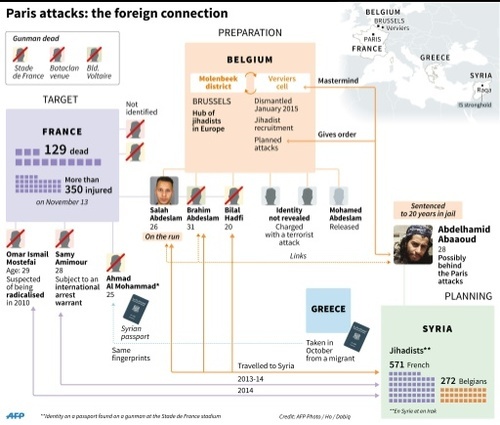 Abdelhamid Abaaoud, a Belgian of Moroccan descent also from Molenbeek and thought to be fighting for IS in Syria, is considered a possible mastermind of the attacks. With emotions running high today, thousands paused in the streets of Paris and across the world for a minute's silence to remember those killed in the worst-ever attack on French soil.